The Soyuz TMA-05M mission had a goal of delivering three members of the International Space Station crew, who represented the 32nd and 33rd long-duration expeditions onboard the orbiting outpost, where the crew planned to remain until Nov. 12, 2012. An international crew bound to the International Space Station, ISS, departed from a Russian launch site in Kazakhstan early Saturday local time. The Soyuz TMA-05M (No. 706) spacecraft launched as scheduled on July 15, 2012, at 06:40:03.91 Moscow Time (02:40 GMT) starting a 120-day mission. The Soyuz-FG rocket lifted off from Site 1 in Baikonur Cosmodrome with Russian cosmonaut Yuri Malenchenko, NASA astronaut Sunita Williams and Japanese astronaut Akihiko Hoshide. Nine minutes after the liftoff, mission control confirmed that Soyuz TMA-05M had successfully reached the orbit. The docking of Soyuz TMA-05M with the station took place as scheduled on July 17, 2012, at 08:51:02 Moscow Time (04:51 GMT; 12:51 a.m. EDT). The spacecraft berthed at the MIM-1 Rassvet module of the station. The fresh crew joined three other members of the 32nd long-duration expedition currently working onboard the station. According to the NASA mission control in Houston, the hatch opening between the transport spacecraft and the station was scheduled for 2:25 a.m. Houston Time on July 17. 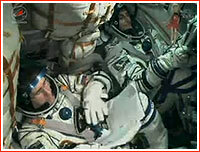 The Russian mission control confirmed that the crew transfer had taken place two orbits after the docking. The Soyuz TMA-05M spacecraft was delivered to the launch site on May 20, 2012. A fully assembled Soyuz-FG launch vehicle with the Soyuz TMA-05M spacecraft was rolled out from the assembly building at Site 112 to the launch pad at Site 1 on the morning of July 12, 2012. 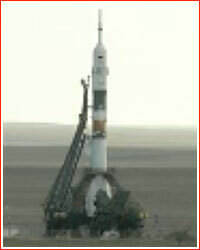 The arrival of Soyuz TMA-05M to the station would bring the crew of the outpost back to six persons. 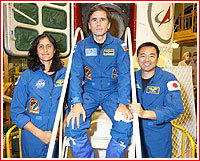 All three crew members of Soyuz TMA-05M were scheduled to serve as flight engineers until Williams assumed command of Expedition 33 as Padalka, Revin and Acaba from Soyuz TMA-04M's crew depart on Sept. 17, 2012. Planned mission milestones (as of July 2012). July 21, 11:06 Japan Time: JAXA’s H-II Transfer Vehicle-3, (Konoutori 3 - white stork), to launch from Tanegashima, Japan (docking on July 27 to the nadir port of the Harmony module. deliver about 7,700 pounds (3.5 metric tons) of cargo including food, beverages, clothing and other supplies needed by astronauts, plus the new Aquatic Habitat, Small Satellite Orbital Deployer, five small CubeSat satellites that it will deploy, a replacement catalytic reactor for the station’s water recycling systems, and a new coolant water circulation pump for the Kibo laboratory. Aug. 7: A Progress cargo ship launch from Baikonur with its docking to the Pirs planned on either Aug. 1 or Aug. 3. The docking date is dependent on a decision by Roskosmos as to whether to test a one-day rendezvous technique as opposed to a standard two-day transit. The cargo craft will deliver another 2 tons of supplies for the station crews. Aug. 16: A six-hour Russian spacewalk, EVA-31, was dedicated to beefing up the service module’s micrometeoroid shielding and relocating the Strela 2 telescoping boom from the Pirs to the Zarya FGB control module. The Strela boom had to be moved in preparation for the arrival of the MLM module, in 2013. If time allows, spacewalkers Gennady Padalka, wearing an Orlan-MK spacesuit with a red stripe, and Yuri Malenchenko, wearing a similar suit with a blue stripe, will retrieve two experiments from the airlock’s exterior and installing two support struts for the ladder outside the airlock’s hatch. A 9.2-kilogram satellite with a diameter of 53 centimeters was to be released by the spacewalkers as a target for ground controllers to refine tracking techniques. Aug. 30: A six-and-a-half-hour EVA by NASA’s Williams and JAXA’s Hoshide to replace one of the four Main Bus Switching Units, MBSU, that are the primary electrical power routing devices on the station. MBSU 1 began showing preliminary indications of failure in October 2011. The unit has continued to provide power without interruption since then, but was expected to fail at some point. Both will wear U.S. Extravehicular Mobility Unit spacesuits, with Williams identified by a red stripe on her suit legs. Hoshide will wear a suit with no stripes. In addition to replacing the MBSU, the pair will route cables needed to integrate the MLM with station systems, and if time allows, install a debris and thermal cover on the Pressurized Mating Adapter 2, which served as the primary space shuttle docking port on the end of the Harmony module. October: The first contracted commercial resupply mission to the station by SpaceX. The flight was to receive a formal target date once NASA signed off on the completion of all of SpaceX’s milestones under NASA’s Commercial Orbital Transportation Services program. Dec. 5: Soyuz TMA-06M launch with Flight engineers Tom Marshburn, NASA; Chris Hadfield, representing Canadian Space Agency and Russian cosmonaut Roman Romanenko. End of 2012: Orbital Sciences to fly its Cygnus spacecraft to the space station on a demonstration test mission. If successful, Orbital was to begin regular resupply missions to the orbiting complex under NASA’s Commercial Orbital Transportation Systems program. The Soyuz TMA-05M spacecraft separated from the MIM1 Rassvet module at ISS on November 19, 2012, at 02:26 Moscow Summer Time (4:26 p.m. Houston Time). According to NASA TV, deorbiting burn to push Soyuz toward the reentry into the Earth atmosphere was planned from 6:58 to 7:03 p.m. Houston Time. The descent module would separate from the habitation module and the service module at 7:27 p.m., followed by the reentry into the discernable atmosphere three minutes later. A command to release the parachute would be issued at 7:38 p.m., with a touchdown projected at 7:53 p.m. Houston Time. According to NASA TV, the spacecraft landed successfully at 7:56 a.m. Kazakhstan Time, some one hour before sunrise and three minutes later than scheduled. The touchdown site was few kilometers off projected point, but still well within allowable area, NASA said around 10 minutes after landing. The descent module was found on its side after the landing. Some 40 minutes, NASA TV reported that the landing site was much closer to the project point than previously thought, some 52 miles east of town of Arkalyk. The crew of Soyuz TMA-05M was extracted in good shape after spending 127 days in space.